Arrange an oven rack 4″ from the broiler and heat broiler to high. Place tomatillos and serranos on a foil-lined baking sheet and broil, turning as needed, until blackened all over, about 10 minutes. Let cool for about 10 minutes, and then peel and discard charred skins. Transfer to a blender along with any juices, cilantro, sour cream, cumin, garlic, poblanos, and 1 cup boiling water; season with salt and pepper, and purée until smooth. Set enchilada sauce aside. Heat oil in a 12″ skillet over medium-high heat. Working in batches, grasp tortillas with tongs and fry in oil until pliable, about 1 minute. Transfer tortillas to a work surface. Place turkey in a bowl and toss with 1 cup enchilada sauce until evenly coated. Divide sauced turkey evenly among tortillas, and roll tortillas tightly around turkey. 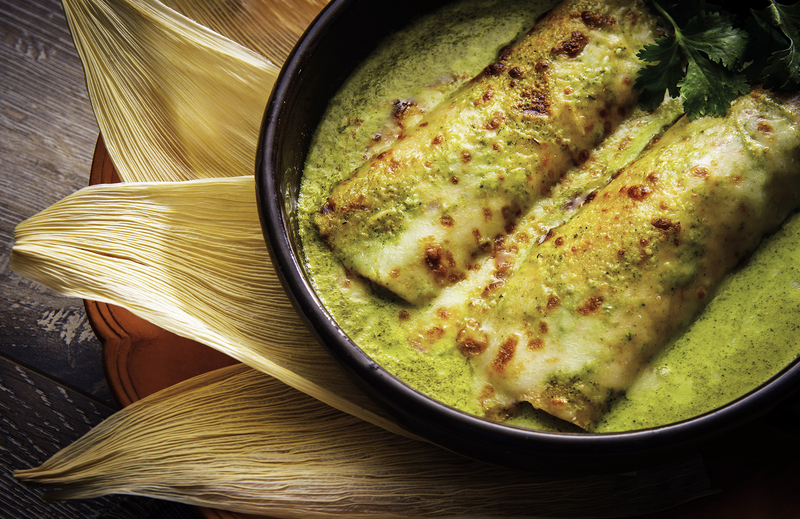 Pour about 1 cup enchilada sauce in the bottom of a 9″ x 13″ baking dish, and place tortilla rolls in dish, seam side down, creating one row down the center of the dish. Pour remaining enchilada sauce over rolls, and cover evenly with cheese. Heat oven to 375°. Bake enchiladas until sauce is bubbling and cheese is melted on top, 20 minutes. Remove from oven, and let cool for a few minutes before serving with lots of sauce. Poached Turkey Thigh Add everything to a deep sauce pan or soup pot and bring to a boil. Reduce heat to a simmer and cook slowly until turkey is very tender, about 2 hours. Set turkey aside to cool. Remove and discard skin and bones. Chop or shred turkey meat. Strain poaching liquid discarding solids and season to your taste with salt. Save stock for a delicious soup or sauce base.